The poster from the game. THE EUROPEAN COURT of Human Rights has upheld a decision of the Ukranian courts not to order an article about the wartime ‘Death Match’ to be amended. The case was brought by a Ukrainian national who believed the contents of the newspaper discredited his father, thus impacting on his and his family’s reputation. Vladlen Mikhaylovich Putistin told the ECHR that the State had failed to protect their reputations by rejecting his requests for the article to be changed or removed. The ECtHR disagreed, however, and in their judgement said no violation of his human rights had taken place. Putistin’s father, Mikhail Putistin, was a Dynomo Kyiv footballer and one of a number of former professional players who lined out for FC Start in a game that became known as the ‘Death Match’ on 9 August 1942. The professional players had started working in a bakery after their league had disintegrated due to the war. The manager Losif Kordik decided to set up a new team using his employees and FC Start was born. The team was invited into the new league made up of German forces and its opposition on that fateful day was Flakelf, the German Luftwaffe team. An SS officer was the man in the middle and, afterwards, there were claims that he did not referee the game fairly. Against the odds – and rumoured pre-match advice – the Ukranians beat the German team 5-3. Although they had won their previous six games, Flakelf were the strongest opposition the Germans had on offer. There has been much written about what happened next and various details are contested. According to the court, the team allegedly suffered reprisals as a result of their victory. Some were sent to a local concentration camp, where four of them were executed. The match received widespread media coverage ahead of its 60th anniversary in the Ukraine. A year previously, on 3 April 2001, newspaper Komsomolska Pravda published an article entitled “The Truth aboutthe Death Match”. It included an interview with a director and producer who discussed the possibility of making a film. 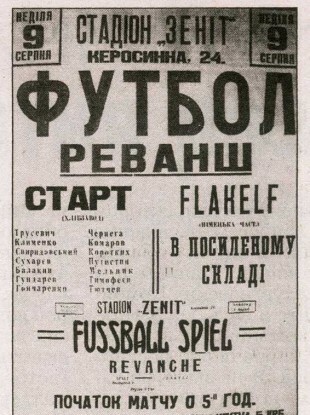 The piece appeared beside a picture of the match poster from 1942 which contained the names of the players, including Mikhail Putistin. However, the names were not legible for readers. During the interview, the producer said there were only four players who had worked for the bakery and they were the ones that were executed. Those names were listed in a separate part of the article. It did not include the name Mikhail Putistin. Other players, he said, “worked in the police, collaborated with the Gestapo”. Later that year, Vladlen Putistin sued the newspaper and the journalist, hoping for a retraction. He claimed that the article suggested that his father had collaborated with the occupying police and Gestapo. During the initial hearing, he provided evidence that the archives held no information showing his father had worked for the Nazis. He also had papers to prove his father had been taken to a concentration camp. Despite the evidence, the Ukranian court said in December 2001 that Putistin was not directly affected by the publication. It said that his father was not named in the text and it was not possible to read his name on the photograph of the match poster. The ruling was upheld on appeal in March and November 2002. In its ruling, which is not final (because it can still be referred to the Grand Chamber of the Court over the next three months), the ECHR said that courts might sometimes be required to protect the reputation of the deceased. It also accepted that the reputation of a deceased member of a person’s family might affect that person’s private life and identity, if there was a sufficiently close link between the person affected and the general reputation of his or her family. However, the court said that in this case, the applicant was only “remotely affected” by the publication because it did not mention his father’s name. Nor did it directly make the allegation that his father had been a collaborator. “The Ukrainian courts had therefore struck a fair balance between the applicant’s right to respect for his private life, and the right of the newspaper and journalist to freedom of expression,” concluded the panel of seven judges. Email “Son fails in legal bid to change 'Death Match' newspaper article”. Feedback on “Son fails in legal bid to change 'Death Match' newspaper article”.